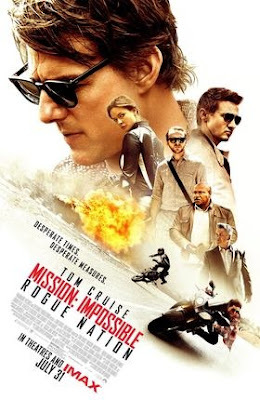 The fifth installment in the popular 'MISSION: IMPOSSIBLE' action franchise; which is a continuation of the classic 60s and 70s TV show (of the same name). Tom Cruise once again reprises the starring role of Ethan Hunt, head of the 'Impossible Missions Force'. In this adventure the team must take on a rogue criminal organization, called the Syndicate. The film was directed by Cruise's buddy, Christopher McQuarrie; who also directed Cruise in 'JACK REACHER', and co-wrote the screenplays for 'EDGE OF TOMORROW' and 'VALKYRIE' (which also starred Cruise). Simon Pegg, Jeremy Renner and Ving Rhames all reprise roles from other chapters; and they're joined, this time around, by Rebecca Ferguson, Sean Harris and Alec Baldwin. It's an excellent addition to the series. The movie opens with a spectacular action scene, involving Ethan Hunt (Cruise), and his team, stopping the sale of nerve gas to terrorists. Hunt next attempts to expose the existence of a rogue terrorist organization, called the Syndicate. He's limited in resources though, when the CIA shuts his team down; and orders Hunt captured and brought in. Hunt goes on the run, while continuing to hunt down the Syndicate; with a little help from his friends. This is an action series that never lets up, or falters; it's as good now as it was when it began, in 1996. One of the keys to it's continuous success, is the fact that they bring in a new director, with a different perspective, for every installment. Brain De Palma's original film is a classic action movie masterpiece; the series went in a completely different direction when Hong Kong action master John Woo took over, in 2000. Ever since, a new (up- and-coming) filmmaker has made the series seem fresh and continuously captivating (J.J. Abrams, Brad Bird and now McQuarrie). People love to compare it to the James Bond franchise, and I think it's even better (it's much more consistent). Cruise continuously proves himself to be one of the best action film stars ever, and he has a lot of great help; from Pegg and the stunningly gorgeous Rebecca Ferguson (as well as the rest). The movie, like it's predecessors, is awesome; I can't wait for 'MISSION: IMPOSSIBLE VI'!